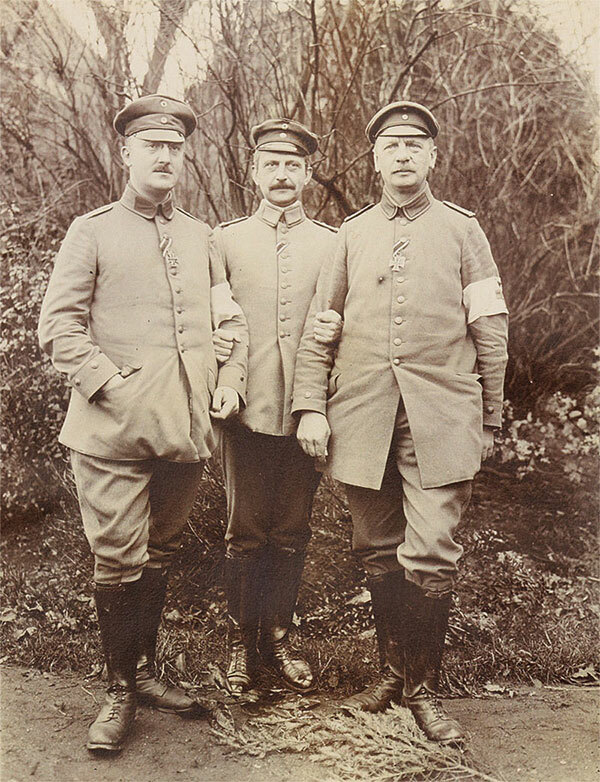 Visitors can see an album with photographs of places along the Western front in our cabinet exhibition “The First World War in Jewish Memory” for only another few days. The album is part of the bequest of a Berliner gynecologist Dr. Carl Hartog (1877-1931), having been given to the museum at the end of 2001 by Hartog’s granddaughter Virginia Van Leer Dittrich. 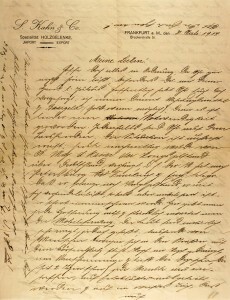 The cultural and literary historian Ludwig Geiger, son of the famous reformist rabbi Abraham Geiger, penned these lines to a friend on 5 December 1914. The “long wait” which had started to trouble him four months after the Great War broke out, ultimately dragged on for almost four more years and yet failed to bring the victory so yearned for. Soldiers at the time could barely imagine what massive destruction this first modern war would wreak. The paltry equipment with which they set off for the front is proof enough of that. 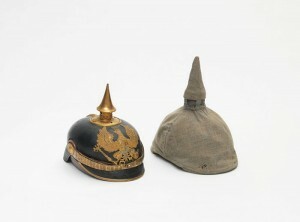 Dr Max Litthauer’s Pickelhaube (spiked helmet) with camouflage covering, 1914–1918. 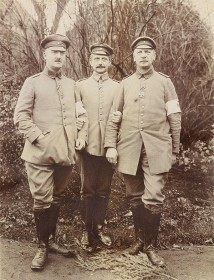 Donated by Bart Ullstein © Jewish Museum Berlin, photo: Jens Ziehe. On display both in the exhibition “The First World War in Jewish Memory” at the Jewish Museum Berlin and in the special exhibition “1914–1918. The First World War” at the German Historical Museum (DHM) are Pickelhauben, spiked helmets made of hardened (boiled) leather and with a cloth covering for camouflage—for a metal spike protruding above a trench and catching the sunlight made its wearer a sitting target. On my guided tours of the two exhibitions, I take the Pickelhaube as an opportunity to talk about how much this war differed from previous ones as well as how ill-prepared the military was, initially, for the new weaponry deployed. 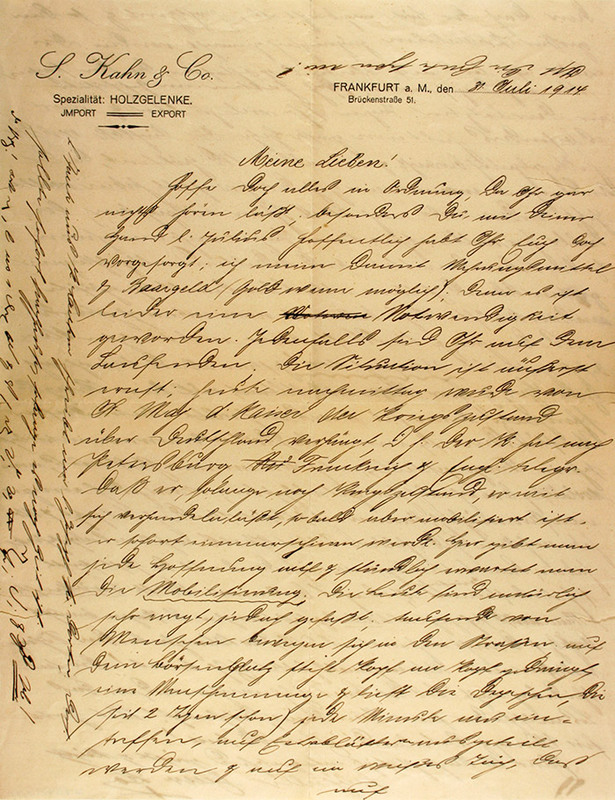 “The situation is extremely serious; His Majesty the Emperor declared this afternoon that Germany is now at war.” Exactly one hundred years ago today, eighteen-year-old Leo Roos penned these lines to his parents and siblings back home in the West Palatine village of Brücken. But they were never to receive his letter, as the note on the envelope attests: Dispatch prohibited on account of the state of war. Return to sender.